Have Fidget Spinners Quickly Gone the Way of Hula Hoops and Pet Rocks And Should They? If you have a grandchild old enough to say the word, he or she has a fidget spinner in their hand. My son-in-law credits me with being the first to introduce spinners to our grandchildren. However, it was our oldest who first showed a fidget spinner to me, so he was able to explain the attraction and the reason behind it. This Grandma could understand, and we immediately went on Amazon to buy adorable spinners he chose for all the other grandchildren. Our younger grandchildren loved them and love all kinds of fidget spinners still. What are fidget spinners? Have you been living under a rock? Check out Wikipedia, of course. Almost immediately after spinners were in every child’s hands, spinners caused a firestorm. Schools have outlawed them. Make sure that the grandchild knows that he or she cannot take the fidget spinner everywhere. We do want to keep their parents happy and not get the grandchildren in trouble. Articles immediately appeared in the media that the original inventor has not received her due or compensation. Articles immediately appeared in the media that scientists say fidget spinners really do not have value to attention deficit disorder children. Articles about the pros and cons of fidget spinners are out of proportion to the issue. You would think that we would be in a slow news cycle! This Grandma says buy two spinners for your grandchild as stocking stuffers and holiday presents. Check out the most recent varieties on Amazon. 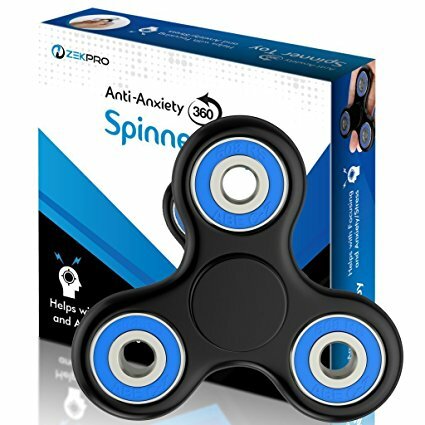 I probably do not have to recommend so, because spinners are the top best sellers on Amazon. There are so many more kinds than even in April 2017 when they gained popularity. Let the grandchildren play with the first, and they will probably quickly lose it. I must have bought dozens of fidget spinners since they became popular. Fortunately, there are so many fidget spinners out there that the prices are almost always discounted now. If the grandchildren have no interest in more than one, advise them to leave the second in the original wrapper and the original box. Tell them about collectors and collections. You probably have started a collection of something with the grandchildren, such as a shell or rock collection, or should think to do so. A collection of fidget spinners may someday have great value. Living long years we have seen such trends come and go. Tell the grandchildren about previous popular items such as hula hoops and hoola hoop contests from the late 1950’s. Or pet rocks from the mid 1970’s. The inventors became millionaires. And collectors of the originals have made lots of money with their pristine collections. Someone in the future may pay a lot for a grandchild’s fidget spinner in its original wrapper. If they can remember where they put it.